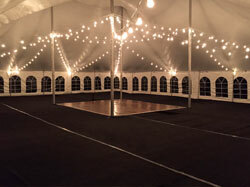 Hess Tent Rental's party rental supplies add elegance, comfort and fun to your wedding, party or other special event! 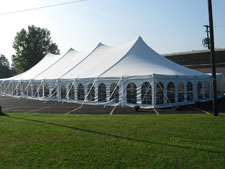 Make your next event in Lancaster, PA, more memorable and less stressful with budget-pleasing party supply rentals and tent accessories from Hess Tent Rental. Whether your event is simple and intimate or something on a larger scale, our experienced team is here to help. We offer a wide range of accessories and high-quality party supply rentals perfect for family gatherings and parties, corporate events, weddings and anniversaries, community events, graduations, public fairs, and much more! 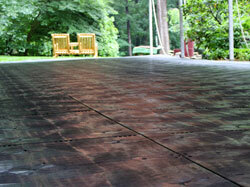 Another option we offer with temporary flooring is event flooring. 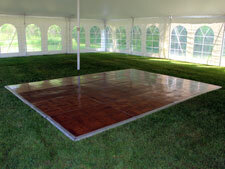 This type of event flooring is designed to create a durable, safe space that can be used for dancing. We offer a variety of sizes, so give us the details of your event and we'll recommend something that's just right for you. Our dedicated and experienced experts will gladly set up your event flooring to ensure that it's secure enough for your guests to dance and gather as long as they want to! For times when you want to create a more attractive and table space, consider temporary flooring. We offer event flooring decks that are 2 inches thick, which is solid enough to provide sufficient comfort and support for all of your guests. Our tent flooring, which comes in convenient squares that lock together, is attractive on its own. However, we can add black carpet as an extra covering. 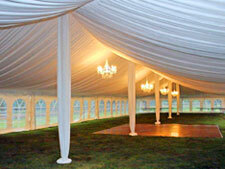 Side Curtains give our tents rentals that final touch of elegance as well as superior weather protection. We have two different styles: solid white curtains and white French window curtains. These curtains come in a variety of lengths. We can make doorways to the tent with these curtains, as well as provide other options for hanging these curtains to let the air pass through or to protect your party from the elements. Dress up your tables with fine table linens designed to fit any of our tables. We offer linens and linen napkins in any color. Elegant napkins are also available! Once you click on the link below, you will be asked to enter a username and password. We understand the importance of proper tent accessories. That's why we provide thermostat controlled propane Heating based on weather conditions. When we install our heaters, we keep the actual heater on the outside of the tent, away from your party, and we run heating duct to the tent, which blows heat in from underneath the side curtains. 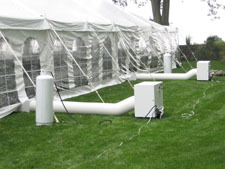 We will help you decide the size heater you will need for your event. When it comes to party supply rentals, get ready to be blown away! 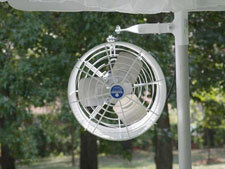 These small, compact, white fans are mounted to the side poles of the tent around the perimeter and create substantial air flow underneath the tent. They are very popular during the summer and do a great job of creating a comfortable atmosphere under our tents while being aesthetically appealing for both formal and casual events. These fans are less formal than the White Wedding style Fans and sit directly on the ground underneath the tent. Although these fans are larger, the air flow they create is more direct and does not circulate throughout the tent as well the wedding fans that are elevated on the tent side poles. 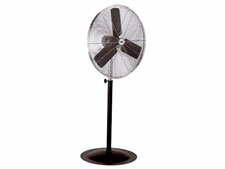 However, these fans move a larger quantity of air in a smaller area. No power source, no problem! 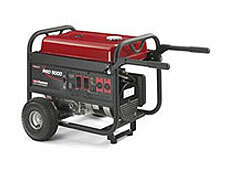 We provide generators that can supply power for computers, lighting, instruments, electronic components or just about anything else you'll need under your tent. Our parquet dance floors provide the perfect surface to dance the night away! The tongue and groove design is expandable to a variety of sizes to suit any size guest list, large or small. When we deliver the event flooring for your guests to dance on, our staff will install it for you so it’s ready to go for your special occasion. While most customers leave the grass as the surface underneath the tent, we are able to offer temporary flooring for the entire tent if it fits into your budget. Our flooring decks are 2 inches thick to keep you up off the ground and they come in 4'x4' squares that lock together. The decks are gray in color, but we can finish the surface with black carpet that we keep readily in stock. Tent flooring can become a costly element of the rental and doesn't make sense for a lot of the events and customers that we service, so please don't hesitate to have a discussion with one of our staff members to find out if event flooring is something that you might be interested in for your particular event! 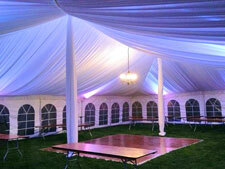 We can cover any side pole around the outside perimeter of the tent with a white sleeve covering to dress up the poles. 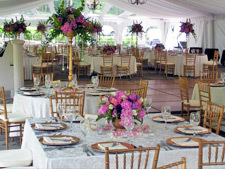 This is a very cost efficient and easy way to dress up the tent a little more for your guests. The interior center poles on every tent are aluminum. If you would like to have these poles covered, we can drape them with white fabric to hide the aluminum poles and dress up the tent even more. 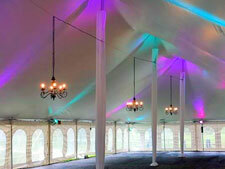 Adding a fabric liner to the ceiling of a tent completely transforms the atmosphere underneath the tent. While our tents are beautiful without a liner, adding this décor item will take the breath away of your guests when they walk underneath the tent. With the addition of a liner, we can add a variety of lighting options as well, such as Candelabra Chandeliers or LED event lighting to illuminate the fabric, which can be read in more detail under the lighting sections of our site. 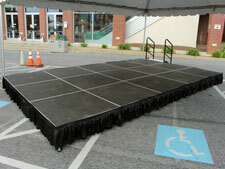 The staging we have available is expandable in 4’x4’ sections and adjustable in height from 12 to 18 inches. The stage decks are aluminum and the tops are finished with a black anti-skid surface. Black perimeter skirting is available for a complete finished look. All prices listed include delivery and are based on a 3 day rental. For example, Unit would be dropped off on a Friday and picked up the following Monday morning. Delivery outside of Lancaster County and a 20 mile radius may require additional delivery fees. 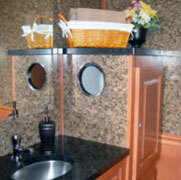 We offer a variety of portable toilets from bathroom trailer rentals to luxury portable toilets. White unit that includes floral arrangement and hand sanitizer. Includes hand sanitizer and floral arrangement. Unit flushes with running water, mirror, sink with running water by use of a foot pump, floral arrangement and soap/hand sanitizer. 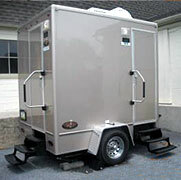 Deluxe restroom trailers require two separate 110AMP circuits and must be placed within 50 feet of the electrical source. We have trailers available that are capable of accommodating parties up to 300 for a 6 hour period and that include separated men's and women's rooms. Trailers are equipped with air conditioning and heating, interior and exterior lighting, powered ventilation, full size mirror above sink and lighted occupancy signals for both the men's and women's side of the trailer. To reserve accessories for your wedding or special event, contact us today! Ask us about reputable caters, florists, photographers, tent rentals, and wedding planners. 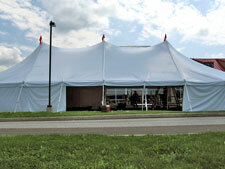 At Hess Tent Rental, our goal is to make your next event in Lancaster, PA, something special! We can even help you out with recommendations for caterers, florists, photographers, and wedding planners. If you need some ideas, check out our photo gallery. Contact us today by email or call (717)665-6957 to tell us about the event accessories or party supply rentals you need. "Kristina and I just wanted to thank you all for making our wedding day so special. It truly was a dream come true for both of us and we couldn't ask for anything more. Everything was just perfect, even the weather was beautiful. We really enjoyed working with all of you. Often times you only hear feedback when it is negative so we wanted to make it a point to personally thank you for the part that you played in making our fairy tale wedding become a reality. Good luck in all that you do, we wish you the very best. God bless!" "Thank you for your help in making our Holiday Party such a great event. We appreciated your generosity with the heat in the tent. All our attendees commented on how wonderful it felt. Thanks again for working with us." "Dear Mike & Staff: Thanks so much for your professional service in providing the tents/linens/lighting for our daughter's wedding on September 10, 2011. Following a week of historic flooding it was somewhat amazing that we were able to go through with an outdoor wedding. I appreciate your flexibility and understanding in our decisive moments related to the weather. I will highly recommend you to anyone that I know who is considering tent rental and will certainly consider your services for our next event. Thanks again for your contribution to our special day." "Mike, It was a pleasure working with you. We want to let you know that the LED lights were amazing! Thank you for helping to make our day special. I have attached a photo of the tent at night if you’re interested. Thanks again." "Mike, I wanted to send you an email and say thank you so much for supplying and setting up the chairs for our wedding on Saturday, July 7th. They looked great and were set up perfectly. Not having to worry about the chairs made our day less stressful. You all were great to work with from the beginning to end. We are very pleased and will recommend you to our friends." "Mike, Thanks again for your awesome service and great communication. You guys were excellent."